An old girlfriend of mine, twenty years ago, taught me to love this poem. I'm glad she did. Thanks for the reminder, Matt. And Walt, wherever you are, happy birthday. I don't know when I first saw this scene, but I know that when I did, it was at a time when I knew next to nothing about movies, and even less about acting. I've learned a little since then...enough, at least, to be able to recognize that film acting is very much its own strange art, one which requires its practitioners to pore themselves--their emotions, their characters, their thoughts--into specific, stylized moments, moments captured in close-ups, lines of dialogue, and brief movements, all so as to give editors and directors the ability to build a story from the splices of film they shoot. On the stage, as a traveling thespian, doing summer stock and memorizing the classics, Hopper probably wouldn't have amounted to much. He wasn't a great actor in that sense. But when he wasn't completely wasted by drugs and alcohol, and when he was in the hands of a smart director (or directing himself), he knew how to take words, how to look while saying them, how to glare as they came out of his mouth...and the result, often, was cinematic gold. Those 30 seconds from Apocalypse Now taught me that, and have stayed with me for decades. A great performance, in a great film. Rest in peace, Dennis. If we're talking loud music from the height of the Friday Night Videos era, Van Halen is, of course, unavoidable. And who would want to avoid them, anyway? The only question, then, is...which Van Halen? The pulsing, bluesy, outrageous, we're-just-doing-this-to-get-laid sound of David Lee Roth? Or the driving, sharp, ponderous, screaming-at-people-to-pay-attention sound of Sammy Hagar? They both have their appeal, obviously. But for their hard-core fans, I'm not sure it matters much. Jimmy Carter won the White House in 1976 by riding the wave of anger and disillusionment that followed Gerald Ford's pardon of Richard Nixon. Carter tapped into that anger with the slogan "I will never lie to you. "...Four years later, however, he was a political pariah. Voters embraced Ronald Reagan because he wasn't Jimmy Carter, proving that good slogans do not necessarily produce good government. Unlike Carter, Reagan had more than slogans. He came to Washington with a clear plan to revive the economy and overhaul the tax code, revitalize the military, and, most important, boost the national spirit....There's a profound lesson in this for the Tea Party movement. Bennett compares the Tea Party movement to the same movement which Carter was able to tap into in the wake of the Nixon scandals. Like Carter (or as he presents Carter, anyway), Tea Party activists push their slogans--against government spending, against high unemployment, against a supposedly out-of-touch federal government--with a simplistic moral fervor. And Bennett doubts that such zealous slogans will add up to much when the time for governing comes...in the same way that, in his view, Carter's slogans didn't add up t much either. [W]hen the new members of Congress whom these slogans elect in November take office, the question becomes: Will they be Carter or Reagan?...As president, Carter was downright depressing. His famous "malaise" speech warned us that America's best days were behind us and suggested that we are a country in irreversible decline. Too many Tea Party speeches sound the same note, even as they invoke Ronald Reagan's name. They are wrong to do so, in my view, because Reagan never lost his optimism and his hope for the future. He was elected because he was good at slogans, but he succeeded as president because he focused on solutions. I urge all of the Tea Partyers to follow Reagan, not Carter. If they want their movement to be more than a wave that crashes on the beach and then recedes back into the ocean, leaving nothing behind but empty sand, they should stop the "gloom talk." These are not the worst times we have ever faced, nor is the Constitution under serious threat....After all, we survived Jimmy Carter, didn't we? Ha! Nice last shot there, Senator! I think it completely misses the reality of the historical record, though. Our people are losing that faith, not only in government itself but in the ability as citizens to serve as the ultimate rulers and shapers of our democracy....In a nation that was proud of hard work, strong families, close-knit communities, and our faith in God, too many of us now tend to worship self-indulgence and consumption. Human identity is no longer defined by what one does, but by what one owns. But we've discovered that owning things and consuming things does not satisfy our longing for meaning. We've learned that piling up material goods cannot fill the emptiness of lives which have no confidence or purpose. We know the strength of America. We are strong. We can regain our unity. We can regain our confidence. We are the heirs of generations who survived threats much more powerful and awesome than those that challenge us now. Our fathers and mothers were strong men and women who shaped a new society during the Great Depression, who fought world wars, and who carved out a new charter of peace for the world. We ourselves and the same Americans who just 10 years ago put a man on the Moon. We are the generation that dedicated our society to the pursuit of human rights and equality. And we are the generation that will win the war on the energy problem and in that process rebuild the unity and confidence of America. We are at a turning point in our history. There are two paths to choose. One is a path I've warned about tonight, the path that leads to fragmentation and self-interest. Down that road lies a mistaken idea of freedom, the right to grasp for ourselves some advantage over others. That path would be one of constant conflict between narrow interests ending in chaos and immobility. It is a certain route to failure. All the traditions of our past, all the lessons of our heritage, all the promises of our future point to another path, the path of common purpose and the restoration of American values. That path leads to true freedom for our Nation and ourselves. Frankly, I would be delighted if the Tea Party activists did talk like this; it would be wonderful to discover that, in fact, at least some of them really did talk like Carter spoke, rather than the equally simplistic, equally moralistic--even by "conservative" measurements!--slogans that Reagan himself used repeatedly. And perhaps there are many such activists out there. But instead, at least on the basis of those activists making their voices most clearly heard, what we see in the bulk of those involved in Tea Party protests--and those challenging decent, responsible, establishment Republicans like Bennett--is something very far from the earnest lessons of Carter's focused examination of America's character (however poorly he himself executed those lessons). Instead, it is a lesson which teaches the value of a context-free, tantrum-prone, angry confidence in individualism--and therefore, a rejection of the compromises inherent in responsible democratic government. Mark Lilla described this aimless libertarianism as representing "a new political type: the antipolitical Jacobin. The new Jacobins have two classic American traits that have grown much more pronounced in recent decades: blanket distrust of institutions and an astonishing—-and unwarranted—-confidence in the self. They are apocalyptic pessimists about public life and childlike optimists swaddled in self-esteem when it comes to their own powers." Surely, this isn't the gloom which Bennett (wrongly, I think) attributes to Carter; rather, it's downright...Reaganesque. If nothing else, it wasn't the spirit of Carter's moral seriousness which resulted in Bennett losing his job; it was the spirit of someone who was convinced, unreasonably, that anyone in government must be part of the problem. Bennett, far from encouraging those who come after him to adopt the attitude of his Republican hero, ought to be encouraging them to think twice about the insight of the man he beat. Every Memorial Day (or thereabouts), it's the same thing, and every year, it's a delight; one of Melissa's and my most enjoyable family traditions. The jam, strawberry crisps, and ice cream afterward is almost irrelevant. Almost. Can a Good Mormon Make Over $100,000 a Year? This post is, in a sense, a sequel to two older posts: "Can a Good Mormon be a Meritocract?" and "Can a Good Mormon be a Socialist?" In case you can't be bothered to read until the end, the answers to the three questions are: "Probably not," "Yes," and "Sometimes, maybe, but seriously, why would you want to take that risk anyway?" This is the dual notion which guides Wilcox throughout the book or so I believe: he wants, first of all, to let his fellow members of the Church to understand that the relatively enormous wealth and security enjoyed by the bulk of the likely readership of the book--the white middle- and upper-class American Mormon shoppers at Deseret Books--is, in the eyes of God and His prophets, a terrible trial...and second, he wants them--he wants us--to know the teaching of the scriptures so we may better endure this trial. Some might wonder whether Wilcox really had in mind, even implicitly, such a specific audience, but I would suggest that the way he repeatedly turns the lessons of the scriptures (all of which, again and again, as Wilcox demonstrates persuasively and at great length, insist that all the wealth of this world belongs to the Lord, that wealth is a dangerous gateway to pride and sin, and that wealth ought never be used to set one person above another) against the American passion for "building greater" and ever newer and fancier homes (p. 13-14), against the economic territoriality which created "the gulf [that is] Interstate 15" through Salt Lake valley (p. 27), against the American passion for unnecessary and luxurious "dainties" (p. 83), against the "extravagant" salaries of Fortune 500 CEOs (p. 117), against our unwillingness to make do with "modest" clothes, cars, and homes which would save us from consumer debt, despite direct counsel from President Hinckley to the contrary (p. 158)...all of this, and more, points to the idea that we should take Wilcox's claims as not abstract suggestions, but very specific and pointed warnings. Wilcox, to be sure, is no Hugh Nibley, pouring out prophetic outrage upon a people entirely too comfortable with the peace and prosperity which have come along with acquiescence to the American way of life...but, it seems to me anyway, it's unlikely that someone of Wilcox's intelligence and diligence could study what the scriptures have to say about prosperity so thoroughly and not end up sounding some of the same themes. This is where the first two questions come in. If these really are the sorts of principles that good Mormons are to commit themselves to, then should we really feel at peace with making life choices premised upon always pursuing (and expecting to be rewarded for) excellence and advantage, in any field of endeavor, even if we "merit" it? Should we really feel at peace with making life choices premised upon the constant (and, presumably, self-interested) expansion of ownership, opportunity, and profit, even if we have "earned" it? Both ways of seeing ourselves and the world, at the very least, invite constant comparisons of the sort which Wilcox sees being explicitly condemned in Jesus's parable of the laborers (p. 41-43), and invite a lack of gratitude for the simple things which Wilcox sees Old Testament prophets calling for us to value most (p. 126-127). Does this mean that Wilcox thinks the scriptures' frequently condemnations of wealth should be taken as a condemnation of work, or trying to improve ourselves? Hardly. 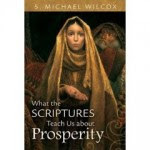 If anything, I would actually argue that Wilcox's use of the scriptures, and the warnings he directs against his mostly wealthy (or at least comfortable) readership from out of them, are to a degree parallel with the arguments made by Matthew Crawford in his book Shop Class as Soulcraft (discussed in a Mormon context here). After all, great wealth, in today's globalized and information-based economy, is most often the result of a specialized education and involves elite tasks (and Wilcox has some sharp things to say about the inequality in the "position or the prestige that society has placed on any particular occupation"--p. 28), both of which often tend to take people away from the virtues of humbler, more serviceable tasks. (Wilford Woodruff's sharp comment is relevant here: "The tendency, which is too common in these days, for young men to get a smattering of education and then think themselves unsuited for mechanical or other laborious pursuits is one that should not be allowed to grow up among us...Every one should make it a matter of pride to be a producer, and not a consumer alone"--Millennial Star [November 14, 1887], 773.) The take-away lesson, I think, is that if we take seriously the scriptural and prophetical warnings about the "sore trial" of prosperity, and if therefore we truly want to be humble and charitable, to avoid contributing to the divisions and deprivations caused by great inequalities in wealth, to devote ourselves to our fellow man and the principles of Zion and consecration, then, eventually, we're going to have to ask ourselves if, in our economic lives, our own choices might not be getting in the way our own best intentions. And that brings us to the third question. Wilcox talks about an experiment he once conducted, more than 30 years ago, with a class he was teaching in Colorado. "I heard on the news the salaries of the top three executives of the bank that held most of our subdivision's mortgages. The three salaries totaled more than one million dollars. They each make about $400,000 per year. (I do not know how much that would translate to in today's figures, but certainly a great deal more.)" In discussing the law of consecration with his class, "the students decided to find out how many families' interest payments on their home loans supported what the students called the 'excess reimbursement' of the three executives. They theorized that the bankers should each earn a yearly salary of between $80,000 and $100,000. Many of my students stated they did not think they would ever make that much in a year, but they wanted to overcompensate the bankers rather than undercompensate them." If you're one of the middle- or upper-class American Mormons that Wilcox is talking to, and you have a mortgage on a typical suburban home, then you can guess where this is going: "Because I knew roughly the amount of interest each family in my neighborhood paid to finance their mortgages, we divided that amount into the excess payment figure. The entire interest payments of more than 130 families were going to support the excess salaries of three individuals. I think we were all a little shocked by the numbers" (p. 185). Indeed! Does Wilcox say the scriptures call for the confiscation of that "excess payment"? No. Does he say that there is no possible way someone who takes seriously the principles of consecration ought to earn that "excess"? No. What he does say, though, is colored by the economic downturn which soon visited that area, and the many neighbors of his who lost their homes to foreclosure: "We are asked by the Lord to operate our stewardships as best we can and then do all the good we can with what remains after our own, generally basic needs are met" (p. 186). What do we need to fulfill our own and our family's needs? What do we need to avoid the pride and temptations of success? What can we let go of, and dedicate to our fellow man? They aren't impossible questions to ask oneself, or to answer. We have examples of members of the church who have. Lowell Bennion--whom President Hinckley praised as a man with such good enough priorities that he never drove a car nearly as nice any of those in the parking lot at his own funeral--saw it as very simple: "Learn to like what doesn't cost much....Learn to like plain food, plain service, plain cooking....Learn to like gardening, puttering around the house and fixing things....Learn to keep your wants simple and refuse to be controlled by the likes and dislikes of others." Beyond that? Give it away. Last year, Ronan shared with us the story of an Oxford professor who pledged to give away all of his income over about $30,000 a year. Ronan allowed that he probably could not do that--but that, given his family's needs, perhaps he could limit himself to $75,000, setting aside the rest to doing good. It reminded me of a conversation Melissa and I had while driving up Provo Canyon, one autumn day soon after we were married in 1993. We agreed that, honestly, we couldn't understand why any typical family--allowing for all sorts of extenuating circumstances, of course--would ever need more than $60,000 a year. Now, 17 years later, we recognize we were a little naive about our own needs, desires, and--yes--temptations. But hopefully not too naive. Wilcox and his students overcompensated the bankers with $100,000 a year, and yet were still able to do enormous good with the remainder. Wilcox, clearly, wants us American Mormons to think about our own "remainders," and be willing to let it go. Are their legitimate debates about how we should let it go, and where it should go to? Absolutely. But to get to the point of asking such questions will mean, I think, that we will have answered the earlier and more important ones correctly, and thus are on the right path of negotiating our peace and prosperity in the way Elder Ballard hoped we would. Friday Morning Videos: "Owner of a Lonely Heart"
Did I say loud? Did I say prog-rock? Well, you know that means. Do you think the band members of Yes argued over who got to be the iguana? 1) I thought about how President Obama has regularly, both before his election and after, criticized the huge presence which electronic and video gaming, networking, and communication plays in the lives of young Americans--and also about how little many of those same young people, including many who generally agree with the president's policies, either get angry or just shake their heads in bemusement, assuming that his message much be a politically calculated effort to look like a "tough parent" for suburban audiences, never considering whether there might be some genuine science--not just anthropological and sociological, but psychological and neurological as well--behind his concerns. Would Carr's book ever reach that audience? I'm hopeful, but doubtful. 2) I thought about my own history use of the internet, of blogs and e-mail and all the rest, and the weird compromises our family has made in regards to digital and wireless technologies. We resisted cell phones for years, but then ultimately broke down; now Melissa and my oldest daughter carry theirs everywhere. We went without a high-speed internet connection for the longest time, then changed our minds, and started struggling with our local provider to get a wireless connection to our laptop. We haven't had cable or broadcast television in our house for years, yet we are all always watching something on Hulu or Youtube or Netflix Instant Play. In short, while I may play the resolute agrarian/communitarian/populist/localist/radical democrat/quasi-Luddite on the blog, the truth is I'm every bit as divided about the progress of technology as Rod Dreher was when he guiltily admitted his geek-out over the iPad. 3) It was my thoughts about Dreher's predicament, I suspect, that got the attention of Nick Carr's publisher, and ended up with me holding a copy of the book in my hands. A lucky break for me, for while I was familiar with--and tended to agree with--the claims Carr made in his famous Atlantic article, "Is Google Making Us Stupid? ", in truth I might not have ever read the book otherwise, and that would have meant missing out on a marvelous synthesis of neurobiology, textual history, sociology, literary criticism, psychology, and more. The book's arguments are broad, but its overarching thesis is a simple two-pronged one. First, that the internet has an "intellectual ethic," just as every "intellectual technology" does, "a set of assumptions about how the human mind works or should work" (p. 43). The assumptions at work in and through the internet, as it happens, are ones which revolve around snap judgments, thin generality, shifting attention spans, multitasking, flexibility, and most of all, distractions: the ethic of "the juggler" in other words (p. 112). Second, that in becoming jugglers of information we are actually making it--neurologically, psychologically, structurally--harder and harder for our own brains to do anything otherwise. The "deep reading" made possible by the ethic of the book--the way we could learn to enter into, identify with, creatively work through and embrace or reject a written argument (pp. 71-72)--has a neurological reality to it, and when our brains mold themselves to a different environment of reading, basic cognition, long-term memory, and learning are all dramatically affected, and not in a positive way. On the contrary, we become habituated to viewing all information--literature, science, journalism, scholarship, whatever--as something to be "strip-mined [for] relevant content" (p. 164), and rather than thereby supposedly refining our ability to recognize (in classic marketplace of ideas fashion) good information from bad, in fact our capacity to make learned judgments is physically undermined. Carr quotes neuroscientist Michael Merzenich, who bleakly sums up the research: we are "training our brains to pay attention to the crap" (p. 140). 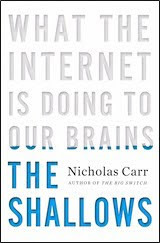 The conclusion towards which Carr's theses point is not that the internet and all the services and toys it makes possible are to be destroyed. Hardly--Carr himself admits "I'm not sure I could live without it" (p. 198). But it does warn us that there is a real reason to slow down and be cautious in our adaption to these tools...which, really, is all that us fuddy-duddy parents (and President Obama too) have been talking all along. Should we reject this advice, the results, Carr thinks, could be very bad. Bad in a human sense, as it may mean the slow loss of the ability of many to "construct within our own minds the...connections that give rise to a singular intelligence" (p. 141), and bad for our culture--all cultures, really--in that it suggests "the replacement of [a] complex inner density with a new kind of self," one bereft of a patiently accumulated heritage of understanding, and replaced by (here Carr quotes the playwright Richard Foreman) "pancake people, spread wide and thin" (p. 194). Shirky, a digital-media scholar at New York University, suggested in a 2008 blog post that we shouldn't waste our time mourning the death of deep reading--it was overrated all along. 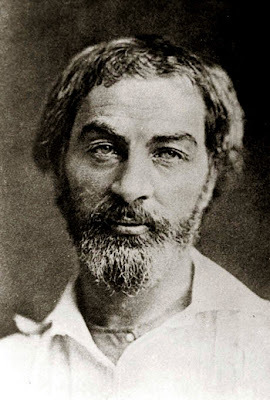 "No one reads War and Peace," he wrote, singling out Tolstoy's epic as the quintessence of high literary achievement. "It's too long, and not so interesting." People have "increasingly decided that Tolstoy's sacred work isn't actually worth the time it takes to read it." The same goes for Proust's In Search of Lost Time and other novels that until recently were considered, in Shirky's cutting phrase, "Very Important in some vague way." Indeed, we've "been emptily praising" writers like Tolstoy and Proust "all these years." Our old literary habits "were just a side-effect of living in an environment of impoverished access." Now that the Net has granted us abundant "access," Shirky concludes, we can at last lay those tired habits aside. But of course, the truth is that I'm very much a part of this distracted world as well; I mean, hell, I've just spent four hours online writing this review. Like Carr himself, I've found it becoming difficult to unplug, to focus, and to read deeply. That's probably one of the reasons why, I suppose, I resolved this summer to actually read some books, so as to maintain my own (already weakened from what it once was, I recognize) capacity for attentively engaging with an argument, and thereby exercising and fortifying those parts of my brain which enable me to do so. The Shallows was the first on that long list, and, if nothing else, it was a very good start. The Beatles perform Shakespeare live on early British television. The end of Western civilization, or its pinnacle? Or both? Quite reasonably, they gave George the best lines. A couple of fascinating exchanges over the past three or four days have caught my eye: first, the long thread which followed Rod Dreher's comments last Friday regarding an interview with a British community organizer and Labor party official, talking about the low level of community responsibility and respect in Britain today. Second, Rochelle Gurstein's vehement response on Monday to a sharp, critical, but also somewhat condescending assessment of Christopher Lasch which TNR had published by Alan Wolfe. What do they have in common? To put it much too simplistically, it's all about whether the Left can make room for hope. This feels like a populist moment. Americans are Tea Partying. Greeks are rioting. Incumbents are being thrown out; the Federal Reserve is facing an audit; Goldman Sachs is facing prosecution. In Kentucky, Ron Paul’s son might be about to win a Republican Senate primary. [By the time you read this, he may already have done so.] But look through these anti-establishment theatrics to the deep structures of political and economic power, and suddenly the surge of populism feels like so much sound and fury, obscuring the real story of our time. From Washington to Athens, the economic crisis is producing consolidation rather than revolution, the entrenchment of authority rather than its diffusion, and the concentration of power in the hands of the same elite that presided over the disasters in the first place. Of course, you can dispute, as Ezra Klein does, Douthat's whole framing of the issue here: Klein argues, and finds support from plenty of self-identified conservative voices for his contention, that if the consolidation of authority makes sense "on a case-by-case basis," then you're essentially passing on the hard questions; you're allowing yourself the luxury of being concerned about "government in general" rather than specifying exactly what you'd rather not be done, or rather be done differently. To the extent that complaints about our current, numerous, interconnected predicaments don't talk practically about compromises and trade-offs, Ezra's charge carries weight. But at the same time, if you never look at the forest as opposed to the individual trees, if you never look at the broader felt context through which various case-by-case decisions are being made, then you're going to fail to respect, fail to serve, even actively alienate those people for whom the context matters. It privileges an individualism, in other words...and individualism which too much of the Left has made peace with, I think. Not that the Right so much more able to practically implement populist responses to this perceived problem; Douthat himself, despite having written a whole book on the topic, doesn't seem to have much confidence in the ability of the current range of "conservative" responses to adequately address this "messy," contextual problem, but at least he knows who he's speaking to when he voices his fears. My question--the one which the argument over Lasch makes implicit, and which the discussion at Rod's lays out explicitly--is: is there a Left audience for these same worries? A liberal Klein, for all his insight into the process, isn't ready to admit that, piece by piece, the process itself could be adding up to an even larger problem. But obviously the world of liberal, managerial wonkery doesn't exhaust the possibilities. Still, it can't be denied that practical, left-leaning voices on this point aren't especially vocal, and that's frustrating. It's a frustration shared by Jon Cruddas, the activist mentioned before, has been engaged in for years: referring to Philip Blond and the way Red Toryism at least hypothetically imagines a "marrying up of liberalism and social conservatism," he wonders: "Is there an equivalent [message] for the left? Is there an anti-statist, values-based politics that offers Labour an opportunity for reconciliation within itself and with its core supporters?" Cruddas's concerns reflect his attachment to the heart of the "Left" side of the political equation--by which I mean, let's say, a commitment to equality, and a willingness to see society, and even society's traditions, changed in order to accommodate that equality. Now clearly, the interventionary state has done a great deal over close to a century of welfare state policies and other liberal social developments, not just in Britain and the U.S. but all across the Western democratic world, to spread access to that equal opportunity and justice. But the consequences of those policies--and, most crucially, the perhaps necessary compromises with market economics which were essential to funding them--have had plenty of negative consequences as well, most particularly in regards to the breakdown of solidarity, community, and democracy which enables people to not only take some real control over their own lives, but also to have a reasonable chance of feeling fulfilled by them. (There's that "context" again.) The classic individualist response--which has come to dominate both Right and Left--is to dismiss this: it's the responsibility of particular individuals themselves to strive for such sovereignty and discover such fulfillment; the community (much less the government) has nothing to do with it. That response is often true...but not always. It certainly is not true when you're dealing with the "core supporters"--or at least one segment of them--of the Labor position, or the Democratic one for that matter: in such cases, we are addressing the needs of people who, at least in part because of a fundamental (and often historical) inequality in terms of access to opportunity and goods and education and more, will frequently be concentrated on the receiving end of any harmful or unlucky changes in the marketplace or family structure or simple demographics...and in such situations, the lack of community hurts a lot, because there may not be family, friends, or neighbors capable of helping out and holding hands in their times of need. The usual response to an attack upon that individualist response is to ask if the one making the attack would prefer "socialism" instead. Usually what is meant there is some kind of hypothetical, ugly, state socialism, a collectivism of all industries and local economies alike. That solution, it is pretty clear from the historical experience of communist states, doesn't actually do much to address the "concentration of authority"--in fact quite the opposite, obviously. But that attack on a particular kind of socialist bogeyman hardly exhausts all the ways in which someone could speak of broadly "socialist" reforms. But to open yourself up to the possibility of such reforms, means opening yourself up to hoping for different, often non-Marxist, often primarily ethical, forms of solidarity, equality, and community...and that brings us back to the basic problem for the Left. As one of the participants in the Cruddas interview put it, calls for community can easily become "King Canute stuff"--meaning that it's impossible to work against the often harmful or unlucky (more harmful and unlucky for some than for others) changes of modern life, or to help generate some way to balance them out, in the same way that it's impossible to hold back the sea. Values and covenants and responsibility and respect are nice and all, but, in the end, "the modern, less constrained individual likes the idea of community but...acts in such a way as to undermine it." So why fight it? At however deep a level, thinkers of the Right--a few of them, anyway--do know why to fight it, because they have a commitment to tradition, and they can see however family breakdown and faceless bureaucracies and moral dissolution can kill it off. (They often fail to note that it is the expanded marketplace and corporate power which not infrequently provides the immediate or proximate cause for all of those things, but at least they're noticing something.) Why might people on the Left do so? Why should they? Well, for a good many reasons, not the least being that real equality, an equality of respect and integrity and membership, demands at least some degree of community conservation, so where people can build lives and have a basis from which they may act compassionately and responsibly towards others. This is, obviously, especially true for that aforementioned traditional core constituency (or one of them, anyway) of the Left, those who have suffered and lost through social and economic dislocations, disruptions which no amount of personal stewardship, however valiant it may be, is likely to be able to effectively contest. Unfortunately, this realization does not seem to come naturally to many within the progressive worldview today (though it is worth noting that when a smart leftist like John Quiggin over at Crooked Timber started talking about what the Left ought to be hoping for last month, he prominently included lessons that needed to be learned from various conservative thinkers, about the perils of an over-reliance on planning, about being too attached to progressive change, and--most relevantly to this post--about the Burkean insight regarding "the need for beneficial reform to be organic," or in other words, to respect and take into account "the actual historical evolution of particular societies"). On Rod's thread, the argument was made repeatedly by several commenters that, while there may well be a few "dissident" leftists here and there, by and large the sort of Democrats or Laborites or liberals or whomever that would be willing to really engage this problem of consolidation and alienation have died out. The poster child of this view? Christopher Lasch. It's reasonable that his name would be brought up--as Lasch, more than any other public writer and thinker in America over the past 30 years, really did take seriously "values and covenants and responsibility and respect"...and moreover, he did it all within a framework that accepted equality, both social and economic, as a central value. Hence the value of the argument over Lasch in the pages of TNR. If the conclusion of smart leftists is that, actually, talking about equality and community or tradition at the same time is a dead end, then the desire to press the liberal establishment to hope for something better than the pragmatic managerialism which dominates both governments and corporations today will be that much lessened. Wolfe's portrait of Lasch, inspired by Eric Miller's intellectual biography, is to my mind a thoughtful and appropriate critical one, but also one filled with condescension. Wolfe clearly admired Lasch's ability to construct an argument and take down an opponent; he calls Lasch's The Culture of Narcisissm a "perfect book...morbidly clever, brilliantly on target, idiosyncratically compelling," and has complimentary things to say about Lasch's other historical studies and polemics as well. But over it all, there is a tone of regret. In Wolfe's view, Lasch chose the wrong target to blame for his complaint with an America which became, through the 1960s, 70s, and 80s, increasingly concerned with identity, diversity, and profitability, and unconcerned with community, solidarity, and equality: "Lasch was," Wolfe writes, "engaged in an endless war against the leftism of the 1960s when the true enemy of American traditionalism would turn out to be the radical right." And Wolfe does not see how Lasch's critiques apply to them as well, because he cannot take seriously as an expression of egalitarian concern the way Lasch, to use Cruddas's words, married "liberalism and social conservatism" to challenge the therapeutic state. The therapeutic state, is for example--with its civil courts, its child protection services, its procedures governing (and sometimes eliding) alimony and child-support payments--a necessary complement to an environment where family responsibilities can be freely and regularly sundered and administratively adjudicated through divorce: Lasch's response, as Wolfe notes incredulously, was simply to propose that in a new Bill of Rights, "divorce [would be] forbidden...in the case of couples with children under the age of twenty-one." That's the sort of traditionalist response that puts, in Wolfe's view, Lasch entirely outside the Left, and thereby incapable of criticizing what he regards--correctly, I would agree--as the primary threat to exactly the sort of "front porch world" which Lasch admired. "Lasch did take a wrong turn," Wolfe concludes--a turn towards a "secular Calvinism" and away from his earlier guides of Marx and Freud which had made him such enable diagnostician of the excesses of the counter-culture of the 60s and 70s. He did not recognize that, in a liberated, modern world, a world made possible by much of the good done by the liberalism which he supposedly became discontent with, insisting upon the depraved nature of human beings, and being suspicious of any effort to manage, coordinate, and distribute their various individual interests and pathologies, "may cause significant injury" to the very world he claims to want to protect. But all this is a failure of imagination on Wolfe's part--a failure, most particularly, to recognize that the insights of both Calvin and Marx might be necessary for anyone on the Left who wants to extend their diagnosis into the present time. Return, for example, to Lasch's comments about divorce. Is this simple, right-learning traditionalism? No. On the contrary, it is a comment which arises from Lasch's commitment to equality--especially an equal respect and support, remember, for that core constituency, those who lack the money or talent or luck to make their way individually through the modern liberated marketplace of goods and ideas. For them, in particular, equal opportunity depends upon intact families, communities, and economies, all of which are threatened by the dissolution of common bonds, norms, and practices...as well as the dissolution of those structures, families most particularly, which perpetuate such. Is his response then to be fully embraced by the Left? Not necessarily; there are a host of other issues which would have to be considered beforehand, many (though not all) of them raised by feminists who are just as concerned about equality. Rather, the point is simply to acknowledge Lasch's opinion as a potential, and legitimate, leftist view, and insist that it, along with many other of his complaints with establishment liberalism, can give ground for people on the Left to truly hope for something. That is, Lasch's work shows us that what might be called populism, or localism, or a particular kind of democratic socialism, or any number of other responses which revolve around seeking to build beliefs and institutions capable of giving people the resources they need to experience real equality and respect within their own lives, is not necessarily an attack upon any responsible left-leaning policy agenda; it can also be an important corrective and complement to it. [Lasch's writings present an] America [which] moved from a localized society of independent, self-reliant farmers, artisans, merchants, and entrepreneurs to a mass society of large-scale production, consumption, bureaucracy, and political centralization, administered in every detail by a new class of professionals and managers. Under these new social conditions, the sources of meaning and happiness became increasingly narrow and standardized: fulfilling, non-degraded work, voluntary associations, family, and friendships more and more gave way to commercialized leisure and the consumption of commodities. This understanding has now become a commonplace of American intellectual and cultural history and Lasch's work did much to shape it. Equally importantly--and this is the most original aspect of his thinking--Lasch's work revealed the psychological, moral, and cultural devastation that "progress" with its cult of "no limits" has left in its wake and articulated its political repercussions in terms that did not and still do not fit comfortably into conventional categories of Left and Right. Gurstein is correct here. Right and Left may be exhausted terms, but so long as we continue to use them, the resources continue to exist for both categories, however defined, to recognize and respond to the consequences of the liberal world...and Lasch--who continued to vote Democratic up until his death in 1994--provides a guide for what to hope for that the Left can respond to, just as well as the Right, if they care to pay attention. Which is, of course, the rub. Wolfe quotes from an essay of Lasch's ("Liberalism in Retreat," in Liberalism Reconsidered, Rowman and Littlefield, 1983) on how Lasch felt "the liberal order should have collapsed a long time ago" due to its "lack of a public philosophy" and inability to "articulate a theory of the good society" (p. 105). He somewhat snidely, and also somewhat unfairly, but also somewhat accurately, observes that "against the ignorance conspiratorialism of today's right, liberalism's theory of the good society, however thin, looks downright robust." Wolfe makes a good point, one which anyone who looks to use Lasch, or anyone else, to hope for alternatives to a continuation of the (often incompetent) managerialism which fitfully governs the planet today needs to keep in mind. Human beings are at least in part products of their environment; in an environment which has conceptually abolished limits (at least for the decision-making and First World-dwelling elite), to talk of re-introducing limits, and developing ethics of community which could flourish within such, needs to take into account the ways in which we human beings have worked to arrange and bless our lives in accordance with the limits we have. Lasch was probably too contrarian to fully admit that. But at least, in that same essay Wolfe quoted, Lasch talks about having the hope and confidence to admit to the complications of the liberal order, and ask questions which refuse to get themselves hung up on particular trees: "If liberals were more confident of their own values, they might see that it is possible to raise these questions [about family life] without demanding a return to the dark ages, to value patriotism...without unleashing a wave of xenophobia, or to imagine a nonsexist division of labor between the sexes" (p. 115). Sufficient hope to ask hard questions, and confidence that they don't always have to answered in predictable, the-present-world-or-nothing ways. Someone of them might be, of course; we may well be stuck with the expert management of individualist rights and demands for many of our predicaments. But hopefully not all of them. Lasch, at least, shows that dissident leftists can hope for that as well as anyone else. In the house, I need to do some repair work on the walls and corners. Three and a half years of kids banging around, plus parents who are constantly re-arranging the furniture, have left a good many scrapes, holes, and cracks to fill and paint over. I don't think it'll cost too much money, especially since my father-in-law has lent me all the tools I'll need. Now it's just a matter of buying the putty and paint and getting to work. Melissa and I have been talking about putting a retaining wall around the garden for a couple of years now, and we'd like this summer to be the year we get it in. But that'll cost money--more than patching up ripped plaster and sealing over cracks will be, especially since we'd like to imagine this to be a permanent improvement to the yard, not just a makeshift repair for as long as we have a garden. I hope we can afford it, but we probably won't know for sure until July. In meantime, I have to put a new door on the attic of the garden shed, as the current one is falling apart and letting the rain and hail in. That one can't wait. Fortunately, I'll probably be able to get the wood cut for pretty cheap, and then I can weatherproof and install it myself. Oh well. Your plans, your reading lists? Share them--I'm curious. Friday Morning Videos: "Only Time Will Tell"
All right! On the with summer! Let's start it out loud, with long-haired former prog-rockers going the big arena route! With lame VHS tape quality special effects! And gymnastics! And remember, this was even before Mary Lou Retton appeared on Wheaties boxes. Obviously, Asia had even more influence than any of us could have guessed. An hour ago, I sent off the final grades for my last class of the school year, the adjunct course I mentioned a couple of months ago, on World Government Systems. It went well; a small class--only ten students--but they listened and asked good questions and the material went over pretty well, I think. How did the movies I chose to show in order to elaborate upon various themes of comparative government go, you ask? Hit and miss, I'm afraid. The Queen was a hit, as I knew it would be--or, that is, knew it would have been, had the sound system in our room been working properly. More than half the students, in their final papers, chose to exam some issue which came up in that film: the symbol of the monarchy, the unwritten constitution, etc. Ikuru, regrettably, wasn't as successful. In retrospect, the most obvious reading of the film takes one inward, viewing it as an examination of one's life choices, and trying to get the students to see it, in a addition to that, as a film which says something about Japanese society and government was probably a little forced. Without more background into just how total the devastation of Japanese society was following WWII, and how the bureaucracy was one of the few institutions which maintain any real continuity with the pre-war years, to say nothing of an awareness of the intensely specific roles which old and young, women and men, long inhabited (and still to a great degree inhabit) in East Asian societies, then Takashi Shimura's performance as the grasping, mumbling, desperate bureaucrat probably just comes off as odd, as well as boring. That was what I perceived amongst the students, anyway. I have to give thanks to a couple of bloggers--Camassia and Stuart Elliot for suggesting a couple of movies which went over quite well (not as well as The Queen, but well enough). Camassia suggested Jana Aranya (The Middleman) for India, which was really a revelation for all of us; not only a smart, quiet film which forced the question of how well and to what degree a stable democratic and/or market society depends upon people being willing to compromise on their principles, but it made me realize that I need to spend some time seriously investigating the work of Satyjit Ray. And Stuart recommended La ley de Herodes (Herod's Law) for Mexico, a funny, violent, and vulgar fantasy of a local politician's rise and fall. Not a great movie, really, but definitely the most fun to watch out of all four of these. If it had just striven for a little bit of stylistic weirdness, it could have been spun as an even better representative of the morbidity and magical realism of the Mexican mindset, to say nothing of their view of the political class. This is our automobile. It's not quite our family--I have more hair, we have more kids, we do occasionally use naughty language, and the treehouse hasn't been built yet--but it's close enough. 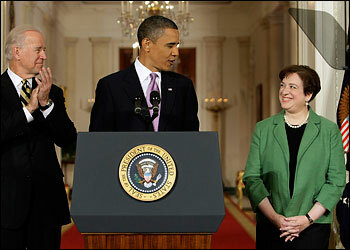 I think the clear similarity is between Kagan and John Roberts, both the very models of a modern Supreme Court justice. The key things you want in a justice are someone who is (a) young, (b) ideologically reliable, and (c) easily confirmable. That points to someone who, like Roberts/Kagan has had a meteoric career rise due to the deliberate patronage of powerful politicians without assembling much of a public record on contentious legal issues. When Roberts was put forward, you had certain BSy efforts to scrutinize his record or “temperament” and discover he was like such-and-such but it was perfectly obvious to anyone with common sense that he’d vote like an orthodox conservative Republican. Similarly, it’s perfectly obvious that Kagan will vote like a mainstream Democrat, with all the plusses and minuses that implies....[I]n principle it would be nice to see presidents nominate people with meaningful public records we can scrutinize, just as it would be nice for nominees to give real answers to questions at their hearings. But presidents and nominees respond to the incentives in our flawed, centuries-old system. But of course, these preferences of my own also lead me around to some of Matt's claims as well--the idea of fixed as opposed to lifetime terms, for example, makes good sense to me. And overall, what he says about the judicial meritocracy, and the exceptionally narrowing process it has on "good" candidates for the court, is simply dead accurate. In the end, Kagan, assuming she is confirmed (and she probably will be; you can't imagine that Obama's people hadn't already counted out all the votes as far as they possibly could into the future before they came to this decision), will be a reliable, smart, acceptable liberal voice. The last great surprise on the Supreme Court was David Souter; no one, of either party, very reasonably, wants to hand the keys to an institution this powerful (unfortunately) over to someone who isn't going to decide things about as predictably as reason allows. For those of us who want something different...well, the problem begins, as always, with the process and the context, not the candidates themselves. Given enough time, anything--well, realistically speaking, almost anything--can happen in democratic politics, and so one probably shouldn't assume that the current election results from Britain definitively signal anything. However, I will bet on one thing: the notion that David Cameron's Conservatives could introduce anything remotely like some genuine Red Tory reforms is dead (at least for now). As I suggested before, it's not clear to what extent the Conservatives ever were, in reality, committed to "associative communitarianism" and the like, or whether their "Big Society" notions did nothing more than just pay some lip service to Phillip Blond's ideas. But either way, we'll almost certainly not find out the truth now (much less find out the degree to which a modern liberal state, at least nominally committed to egalitarian welfare principles, could ever practically follow through on decentralizing, democratic reforms in the first place). As things stand this morning in Kansas (which is Friday afternoon in the UK), we have a messy hung parliament, and current Labor Prime Minister Gordon Brown, knowing full well that his party is willing to promise much more in terms of the electoral reform which the Liberal Democrats want than Cameron's conservatives could, is (purposefully or not) pushing the Conservatives in very nearly exactly the manner least amenable to seeing any hypothetical Conservative-Liberal Democrat coalition government preserve even the least elements of Red Tory promises. That's not to say that associative communitarianism isn't compatible with the proportional representation wanted by the Lib Dems; indeed, I've suggested before that moving away from the American electoral model would actually make various populist/democratic/communitarian political possibilities more likely further on down the road. But the more immediate problem is the broader demographics and interests of the Lib Dems: they are, by and large, very much the sort of socially liberal, fiscally conservative, libertarian-lite, environmentally-conscious elites which Mark Penn idolizes and Jonathan Chait and Ross Douthat properly mock. With the Lib Dems, the Conservatives would likely still not give more power to the EU, and would still likely try for some immigration reform. And true, the Lib Dems would keep the Conservatives' feet to the fire in regards to any welfare cuts. But serious reforms of Britain's corporate market and financial structure? A patient--and expensive--devolution of welfare responsibilities to local communities, with attendant democratic oversight? Not bloody likely. And if that all falls apart? Then it is some other ramshackle coalition for the Conservatives, or a minority government, or it is Labor-Lib Dems doing the same. All of which have, from my point of view, any number of arguably defensible, even appealing compensations. But however you slice it, the as-yet-not-clearly-articulated Red Tory promise is definitely going to get pushed to the back burner, if not off the stove entirely. Perhaps it's just as well; as I wrote yesterday, Blond's (and Cameron's, perhaps) reformist ideas need something more...well, more moral to them--a more broadly shared "religious" conception of what a polity and the government it creates has in common--if they're going to find a legitimate sphere to operate within. And that will likely take decades of time, both in government and out of it. Hopefully Blond, and others, will keep hammering away at Red Tory possibilities for a while. But in the meantime, no matter what happens in London over the next couple of days, I don't expect them to get a test drive. Tomorrow is commencement here at Friends University; it'll be my fourth commencement at Friends, signaling the longest I have ever taught at one place. And, just in case there is any doubt, as of now I hope it'll be the last place I ever teach as well, so I am looking forward to many more commencement ceremonies to come. I like traditions and ceremonies, as is probably obvious to anyone who reads this blog. But this one seems particularly significant to me: this is the first time that I'll be watching students I have known for their entire university careers cross the stage and receive their diploma. Kids that I have known since they were freshman (some of them, anyway), now receiving their duly earned credentials and going forth, having completed the last of our culture's primary middle-class meritocratic obstacles, looking for what comes next. I went to college and graduate school for a total of eleven years myself, so four doesn't seem that long to me...but every year, there are kids and parents and friends with tears in their eyes, thinking that the previous four years have been difficult, precious, and transforming ones indeed. It'll be a fine thing to see that, maybe, in some students I have known all along.